Christmas is an awesome holiday full of food, family, and gifts. Few presents can compare to the bundle of love and companionship found in a cute puppy. But before you stuff that stocking with a dog tag, you need something to put on it. You are in luck. Santa loaded up his sleigh with a bag full of names and then crashed onto this page spilling them all. The jolly old fellow's misfortune is your gain. Don’t let Kris Kringle crash in vain. Take advantage of the spill and get them while their hot (before he gathers them back up and takes them to the North Pole). A holiday themed name is fitting for any yuletide pooch. Check out the full list of Christmas ideas below. Some of our pages will contain a subcategory. A subcategory is a slightly more specific grouping than the main topic of the page. For a subcategory, we will include a separated table of names and corresponding descriptions. An example of a subcategory of Red Dog Names would be 'Dog Names Inspired by Red Wines'. 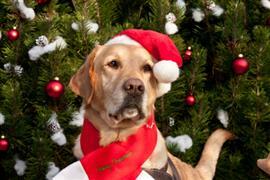 If you have any subcategory ideas for the Christmas Dog Names page, we would love to hear them. Use the form below to submit your ideas.